Where else would you find a seaside community small enough to have village charm, yet large enough to be a world class business environment? Where else but, Carlsbad, California! Carlsbad is a unique coastal community located 35 miles north of Downtown San Diego surrounded by mountains, picturesque lagoons, and the Pacific Ocean.The City is best known for its beautiful beaches, quaint European village, world class golf, Carlsbad Premium Outlets, Legoland California Resort, the Flower Fields, and the La Costa Resort and Spa. 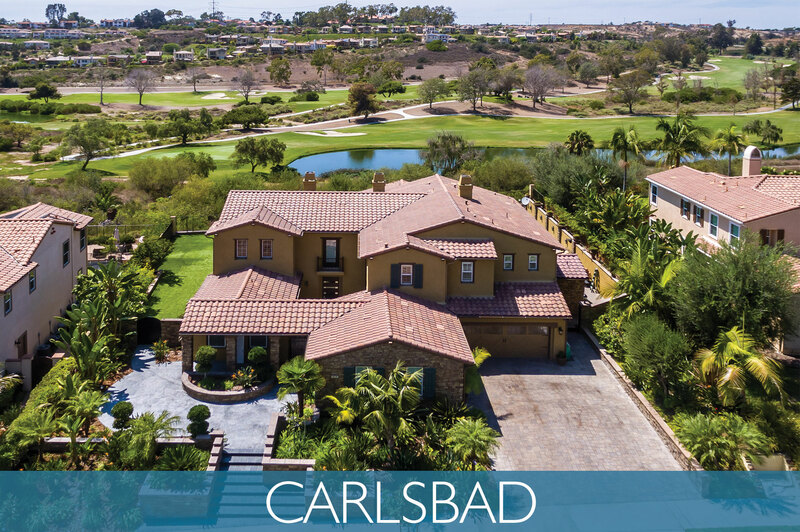 See more about Carlsbad on Pinterest! Carlsbad is home to almost 107,000 residents and attracts thousands of tourists year around. Although Carlsbad has a relatively young population, with a median age of 32 and 78 percent of residents under age 55, Fortune Magazine rated Carlsbad as "one of the nation’s five best places to retire". The magazine boasted that Carlsbad has ample open space, a low crime rate, a near perfect climate, smog-free ocean breezes, and was not on an earthquake fault zone. The City of Carlsbad supports economic development, yet sets aside 40 percent of its land for open space. Although the population has grown considerably, its award-winning Growth Management Plan ensures that the City retains its small town charm. Under strong leadership and sound discipline, the City successfully balances tourism, employment, light industry, the environment, and a high standard of living. Money Magazine named Carlsbad "one of the most desirable places to live in America"! Over the years, Carlsbad has maintained its vast, beautiful outdoor spaces so that they may be enjoyed by bikers, kayakers, fishers, bird watchers, and others. Home to an extensive trail system that ranges from leisurely to strenuous, there are open hills, covered paths, and quiet lagoons which include Aviara Trails, Calavera Hills Village H North Trail, Golf Course-Veterans Park Trails, Hidden Canyon Trail, Hidden Valley-Legoland Trails, Hosp Grove Trail, Agua Hedionda Lagoon, Batiquitos Lagoon, and Buena Vista Lagoon. Carlsbad is home to seven miles of pristine, uncrowded, and sun-drenched beaches. It’s renowned as one of southern California’s best surf spots, but there’s still plenty of water and sand for all to enjoy. Carlsbad beaches include Carlsbad City Beach, Carlsbad State Beach, and South Carlsbad State Beach. Shopping in Carlsbad provides the enticing combination of upscale offerings and a casual atmosphere. The Carlsbad Village is located in the heart of the downtown area and is filled with restaurants, hotels, boutiques, and antique stores. Other highlights of the Village are the historic Carlsbad Mineral Water Spa and the Village Faire Shopping Center, which includes shops, restaurants, galleries, and the Children's Discovery Museum of North County. Other shopping opportunities in Carlsbad include the Carlsbad Premium Outlets, the Forum at Carlsbad, and the Westfield Plaza Camino Real Shopping Center. One of Carlsbad's biggest highlights is The Flower Fields at Carlsbad Ranch. From early March through early May, there are 50 acres of Giant Tecolote Ranunculus flowers to walk through. The breathtaking fields offer magnificent views of both flowers and the ocean. This resort features LEGOLAND California, SEA LIFE Aquarium, and LEGOLAND Water Park. The 128 acre Park is designed specifically to appeal to families with children ages 3 to 12. The Park features roller coasters, Lego-themed rides, interactive shows, hands on attractions, Lego building play areas, the famously breathtaking Miniland, restaurants, shopping, landscaped features and gardens. SEA LIFE Aquarium is designed to be a child’s first interactive guide to the life of the sea, combining active, hands-on learning with fascinating educational talks and opportunities to have up close and personal encounters with a variety of sea creatures. Finally, LEGOLAND Water Park is the first of its kind and is an interactive, splash-filled, fun time for the entire family. Home to one of the largest one day festivals in the nation, the Carlsbad Village Street Faire, don’t mistake Carlsbad for a sleepy surfer village. A wide variety of arts and culture offer a constant influx of creativity and inspiration. Carlsbad is never short on amazing experiences including fine arts, live concerts, classic cars, and craft beers. The music products industry has a multifaceted history from the 1890s to today that is showcased in the fascinating Museum of Making Music which is a division of the NAMM Foundation. Whether a spectator or a participant, Carlsbad hosts a variety of athletic events for all to enjoy. From short runs to marathons, as well as one of the world’s longest running triathlons, the whole community comes out in support. And with unmatched venues and weather, Carlsbad has also become home to several professional golf and tennis tournaments including the Kia Golf Classic Presented by J Golf and the Mercury Insurance Tennis Open. In Carlsbad, golf isn’t just a game, it’s an experience. Beautifully designed, world class courses offer unmatched amenities, such as GPS-equipped golf carts that help gauge your next shot, gorgeous clubhouses to relax in, golf classes with top golf pros, and nearby resorts and spas including La Costa Resort and Spa, Rancho Carlsbad Country Club, and the Crossings at Carlsbad. Starting with a simple mineral spring in 1882, Carlsbad has grown into an unmatched destination for personal pampering. Tranquil in all aspects, the mild weather and beautiful setting are now home to the most advanced and inventive spa techniques. From yoga to mud baths to massage, there’s something perfect for brides, friends, groups, and couples. Carlsbad’s Spas include Cappricio Salon and Day Spa, Carlsbad Mineral Water Spa, Ocean Day Spa, Ocean Pearl Spa, Palms Day Spa, Skinsational-A Skin and Body Spa, Spa Samudra, The Spa at La Costa, and Tranquility by the Sea Day Spa. The City of Carlsbad is easily accessed by Interstate 5 and Highway 78. Travel time to either Orange County or Downtown San Diego is approximately 35 minutes, with Los Angeles and Mexico only one hour away. Carlsbad has a commuter train, great bus service,and the busiest single runway airport in the nation. CUSD accommodates more than 10,000 students and as the district population increases, the Facilities Master Plan and Prop P Construction Program will continue to provide students with well maintained and up to date facilities. CUSD provides a comprehensive curriculum, enabling all students to excel as they meet the challenges and opportunities of our changing world. All of the schools offer students the means to succeed by providing programs that maximize the abilities, talents, and interests of every individual. Established in 1910, this college preparatory, military, residential, and day school for young men grades 7 through 12, celebrated its centennial in 2010. The 64,000 square foot Carlsbad City Library, better known as the Dove Library, opened in 1999. It features a collection of more than 200,000 items and numerous amenities.